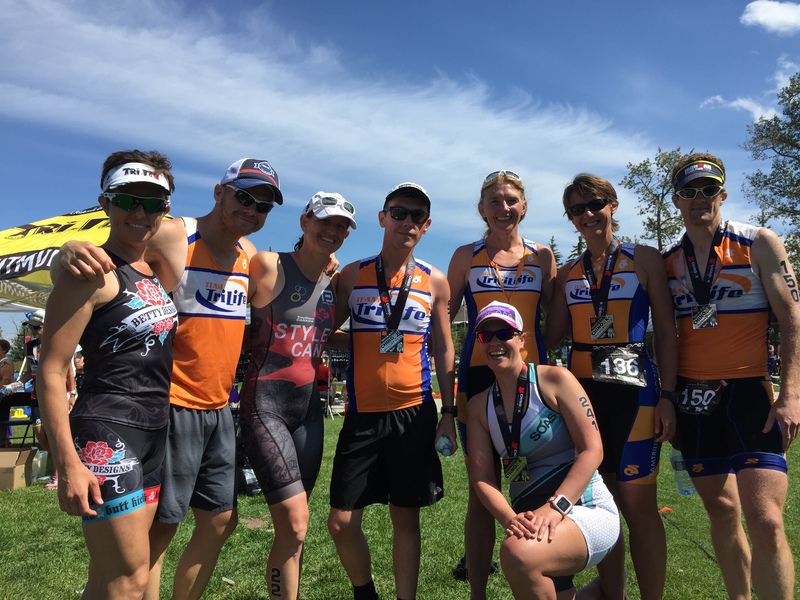 I had thought about perhaps being a bit lazy after Sunday’s Calgary 70.3 but it turns out I was racing again just six days later! 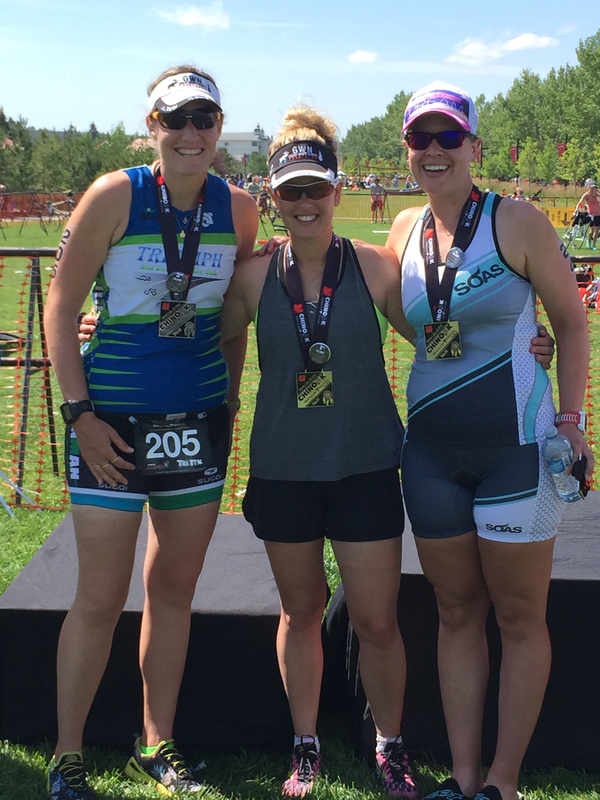 I’ve had the chance to race the Chinook Triathlon here in Calgary a few times, but this year the race was changing. 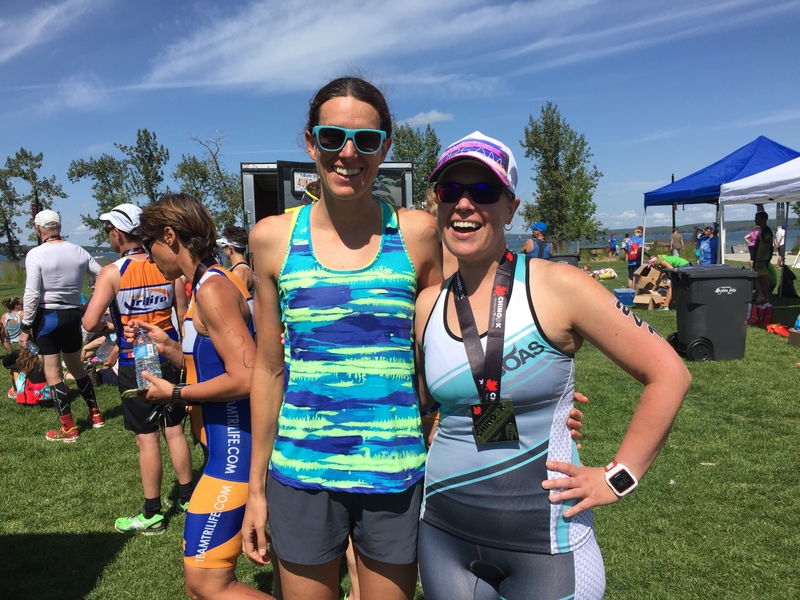 Local pro Jordan Bryden took over race directing duties this year and the race moved from south Calgary to ~2 hours away in Sylvan Lake, Alberta. The timing of the race shifted as well, moving from mid-June to the first weekend in August. 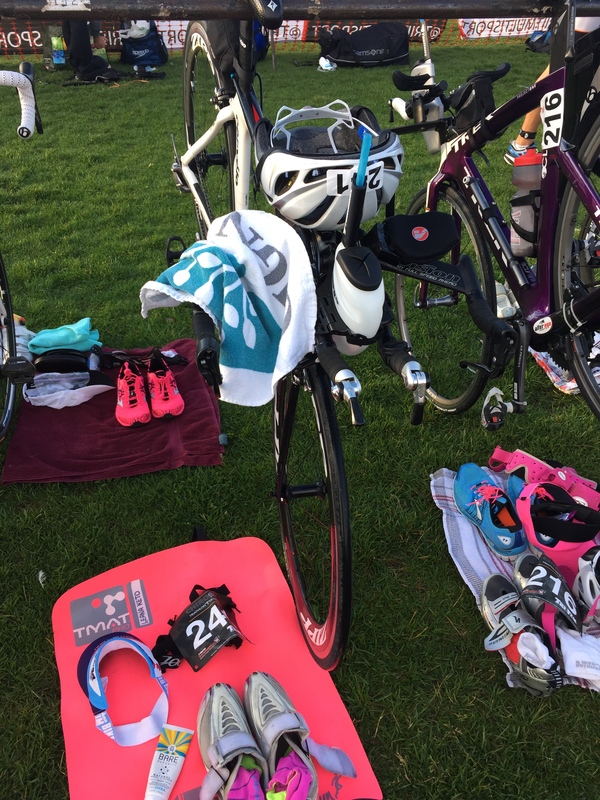 There were a few different options to race: Olympic, Olympic distance aqua bike, half Iron and a half Iron relay team. 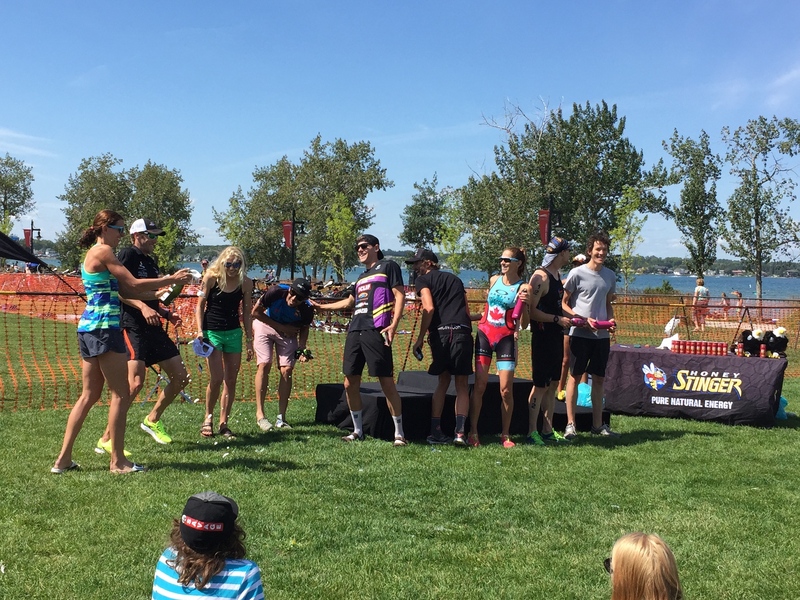 There was also one other exciting event going on…an Olympic distance pro chase. More on that later! 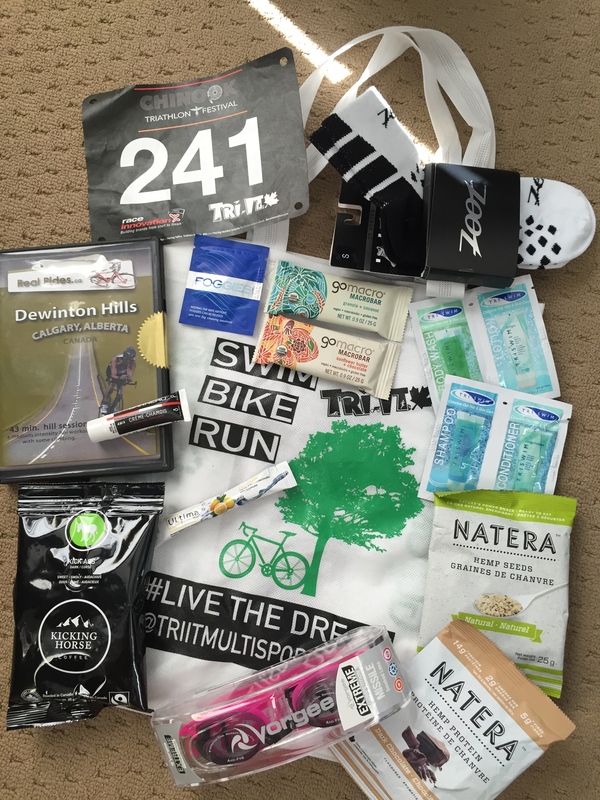 The race organizers lined up some fantastic sponsors and put together a pretty incredible swag bag for everyone racing. Even Peat couldn’t believe the amount of swag! Inside we got Zoot socks, Foggies anti-fog cleaning wipes for your goggles, Go Macro bars, TriSwim shampoo, conditioner, body wash and lotion, Natera hemp seeds and hemp protein powder, Vorgee goggles, Kicking Horse coffee, a Real Rides DVD, Ultima Replenisher Electrolyte Powder, and Louis Garneau chamois cream. My plan was to drive up to Sylvan Lake on race morning. To give myself enough time I figured I should leave the house around 4:30 am. My alarm went off, I looked at it, closed my eyes…then looked at my clock and saw that it was already 4:20!! Yikes! I jumped out of bed and hurriedly tried to get out the door. Finally a little after 5 am with a full tank of gas and a quick detour back home to grab my frozen bottles of EFS I was on the road. I ate half a peanut butter and jam sandwich on the road and overall the drive up to Sylvan went pretty smoothly. I didn’t have a ton of time to get set up in transition. It felt as though as soon as I put everything down on the ground that we were being told that transition was closing. I managed to pull my wetsuit on over my legs, grabbed a quick photo and then started walking over towards the swim start. 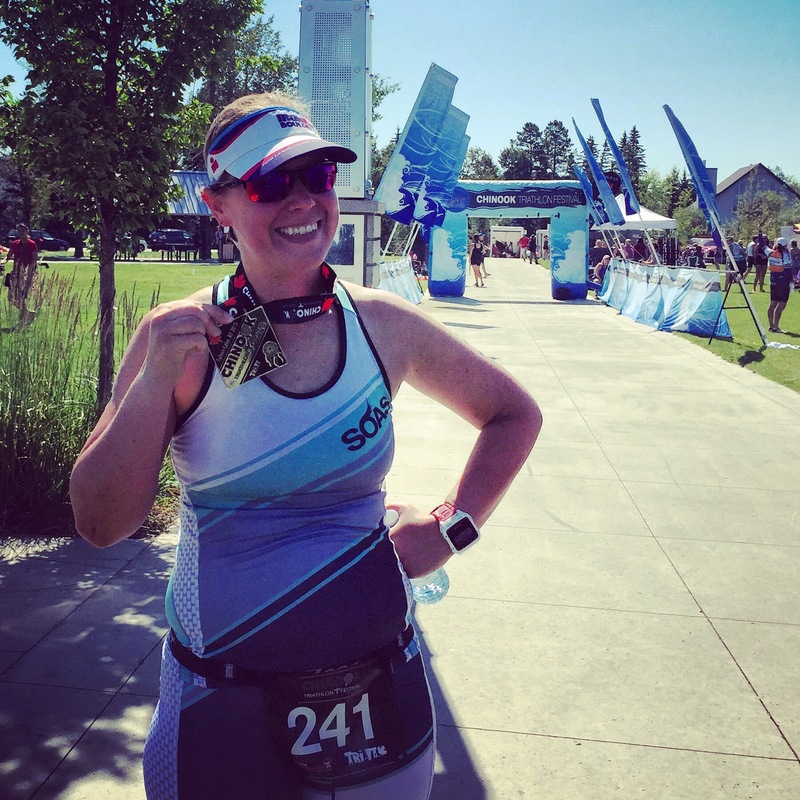 As I walked down I realized that I’d only eaten half of my sandwich on the drive up and that I’d forgotten the gels I had planned on taking in the car – one for before the swim and the other for the run course. Oops…not my best nutrition strategy! I was at the race solo but luckily I found a really nice lady to help zip up my wetsuit and we chatted as the pros went off. Finally with a few minutes before our race time we wished each other good luck and I slipped into the water. The wind had started to pick up as we were waiting for the race to start and the waves in the lake were pretty big. This was definitely the roughest water I’ve raced in. Luckily I swam in some pretty rough water in Kelowna in July so I kept telling myself that I had done this before. I stayed calm and positive on the swim which felt huge to me! I wound up measuring the swim a bit long at 1700 m. I came out of the water 12th female overall (out of 38) so I had a pretty good swim! I didn’t really have a good sense of urgency in T1. I was fussing with my pony tail because it wasn’t going through my helmet properly. Finally I got my act together and got out of there! I focused on keeping my legs moving as they felt a bit sluggish to begin with. Sometimes we had a crazy headwind, other times a cross wind. I tried to keep my effort appropriately hard but I wasn’t trying to hammer into the wind. The bike course was quite pretty and the traffic passing us wasn’t too bad. There were plenty of people managing the traffic at the intersections we were making turns at. Overall I thought the bike course was fun and appropriately challenging! The ride was a bit long, but we had been warned about that at the pre-race meeting so I knew to expect it. Olympic bike courses are generally 40K and I measured just over 47K. One thing I was surprised by was to not see a ton of racers coming towards me as I approached the turn around. Maybe I was having a good day?? I think I finally had a bit more fire and drive to move quickly in T2! For the run we ran two laps of an out and back through the town of Sylvan Lake. The route was nice and flat! I had tried to drink enough calories on the bike that I’d be okay without the gel I had planned to take and had forgotten in the car. There were some Honey Stinger gels out on course but I’ve never actually tried one before and I’m a little wary about taking anything brand new in a race. Instead I just drank water and I focused on putting one foot in front of the other. I tried not to focus on things if running was feeling hard and I kept pulling on all my mental tricks to keep moving forward. On the second lap I spied my friend Carla up ahead and I used that as my motivation to keep moving. The volunteers were so enthusiastic and my Instagram friend Kari gave me a shout out as I ran past! Ultimately I was pretty darn thrilled to come in under an hour on the run especially since I had just raced the Calgary 70.3 the week before! I had no idea how my body or brain would feel about the race but luckily they both seemed to be on board! My day was good enough to earn me a 2nd place finish in my age group! Podium spots don’t happen very often for me, so this was especially sweet! 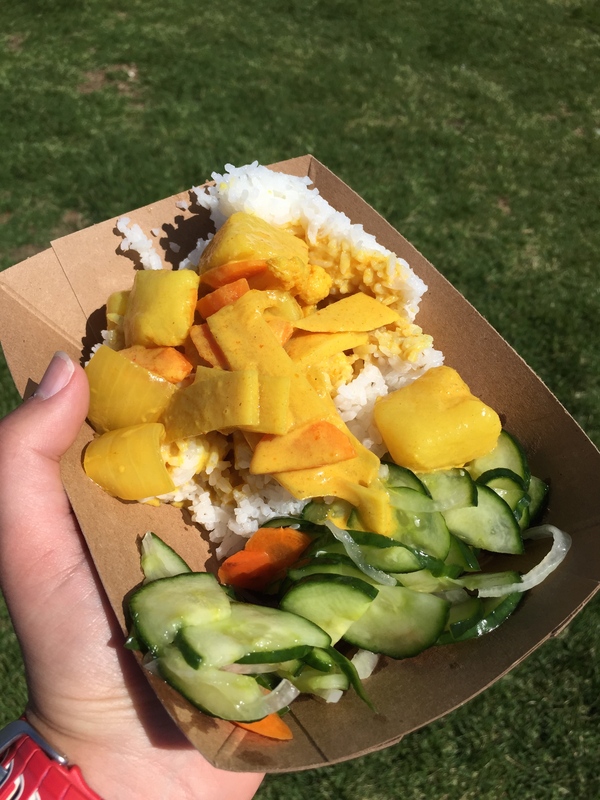 After the race I grabbed some food, a delicious Thai vegan curry from Hearts Choices and chatted with some friends. The pro chase I had mentioned earlier? The pro women started first, then the pro men 12 minutes later. Prize money was distributed among all the top finishers and the real question was if the women would be caught by the men. Heather and Trevor Wurtele were racing and Heather wound up winning! Heather is such a great athlete and inspires me to push hard. It was great to meet her and she was so nice. 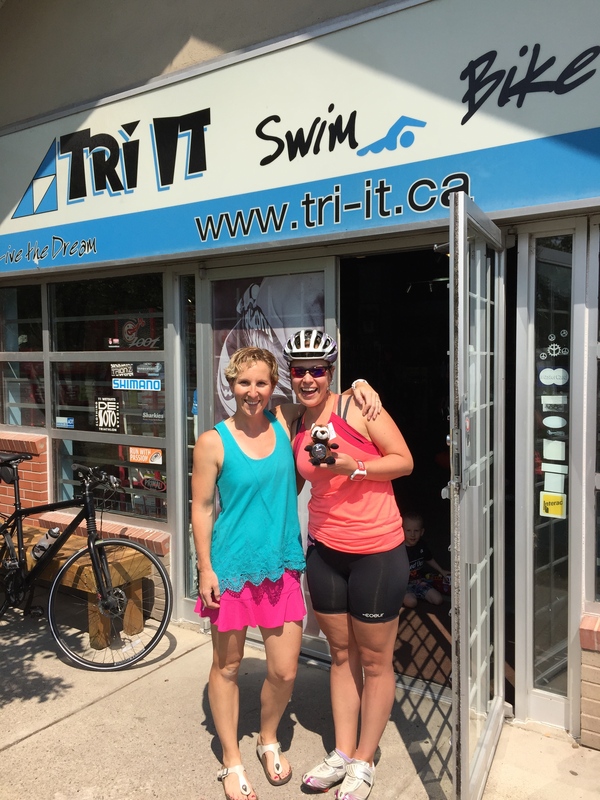 All the best at the 70.3 World Champs and at Kona Heather! I hung around for the awards, although unfortunately our age group awards were missing in action. 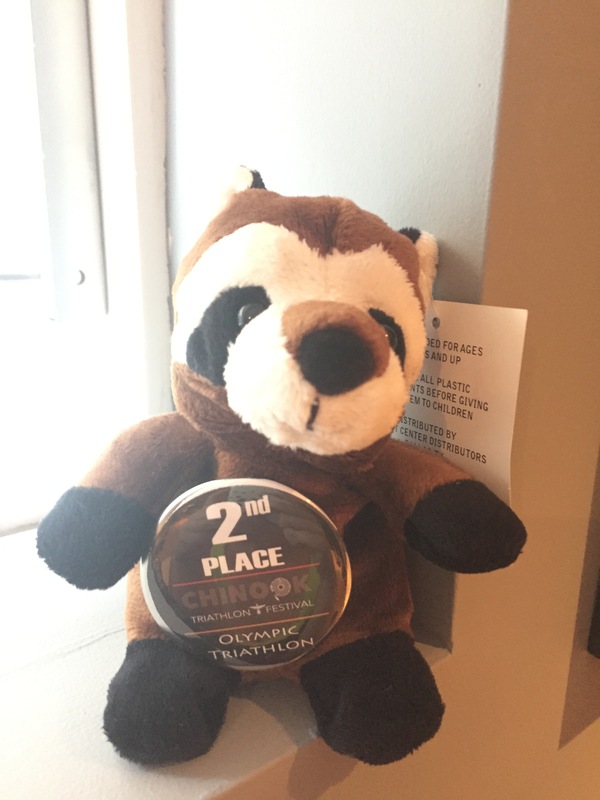 Thankfully Tri-It had managed to track them down and I was able to pick up my 2nd place stuffed raccoon the next day. As for the race, I thought that the race organizers worked so hard to make this a great event. 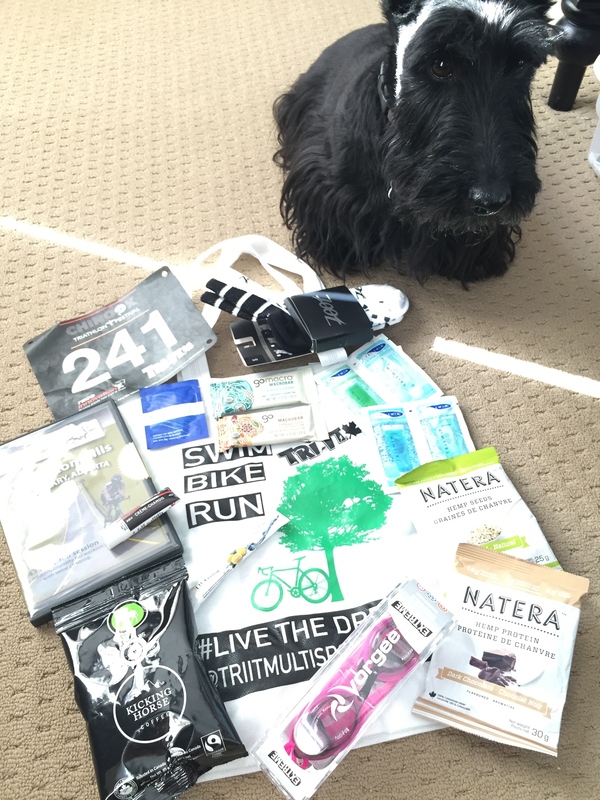 The swag bag was incredible, the racers all earned really nice medals and the post race food was delicious. Sylvan Lake itself was nice even though the water was rough. The bike course was fun and had a nice mix of terrain. The run was flat and fast and thanks to running two out and backs it was easy to see your other friends racing. I think it is great to have alternatives out there to Ironman races so I’d like to support them as much as I can. 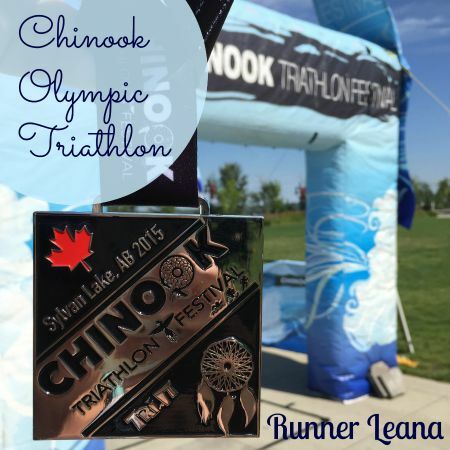 Thank you so much to the Chinook Triathlon race organizers for putting on such a fun event! Well done!! If I get my sh*t in a pile this winter, I’m considering trying this race next year. If you don’t mind, can you let me know how that DVD is? Thanks Amy! I’d definitely recommend the race. The whole crew did a great job and I thought the Olympic course was really nice. And yes, I can definitely let you know my thoughts on the DVD when I try it out. Hopefully it will be a bit longer before I’m spinning in the basement though! Congrats on your second place finish Leana! And after a 70.3, you’re a rockstar. Thanks Jen!! It was such a surprise that I had a good race! Thanks Erin! I’d definitely recommend the race. The race crew did such a great job putting the event on and Sylvan Lake is lovely. Hopefully you’ll have an opportunity to race it next year! As for the SOAS kit, I really liked it! This was my first time wearing the shorts but they were really comfortable and I didn’t have issues with them riding up. There are three little pockets on the back of the shorts if you want to stuff a gel in there. The tri top is long enough and is cut so that it doesn’t ride up and turn into a belly shirt. The two pockets on the back are handy too. Nice soft fabric and I really love the designs. If you find you are between sizes as per their sizing chart I’d recommend sizing down. Kris recently posted…Thinking Out Loud Thursday #26: TWO YEAR BLOGIVERSARY! Thank you Kris!! 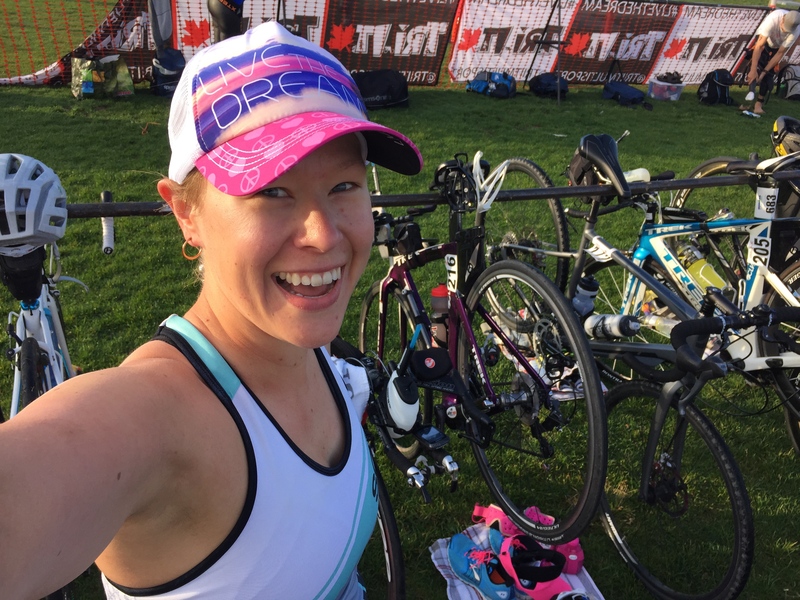 I have no doubt that you’d be able to rock a tri! Congratulations on your finish and taking 2nd place. It’s always nice at events to receive alot of swag. Looks like the weather was a perfect day. Great pics! Thanks Lacey! Yes, we were so lucky with the weather. It was sunny and warm out which was just perfect! A stuffed raccoon is super awesome – I love that! You are looking really good Leana congrats on a great race! You inspire me so much with your dedication!! Awesome. If I was paying attention, I would have driven to Sylvan Lake to say hello! Well done on placing 2nd! Love when that happens especially when it’s a surprise! Great pics too!